Have you ever wanted to have a beautiful big dream catcher for your wedding, event, party or birthday? You have found the right place as Green Daun craft shop provides a dream catcher rental in Malaysia service for just about anyone. The dream catcher rental in Malaysia is actually not expensive when you consider that the large dream catchers are hard to come by and may be priced on the high side. At Green Daun, we actually make them as large as 100 cm (39 inches) in diameter, to be hung at backdrops for events, parties and weddings in Malaysia. Some of our customer even hand them in their homes. As we have a walk-in retail shop in Damansara Perdana, Petaling Jaya, you can visit our shop and see our large dream catcher designs that we have in multiple colors and sizes. We are not your regular online shop, Facebook or Instagram shop where photos are only provided, therefore, this makes Green Daun the only premier dream catcher shop in Malaysia that sells, makes and rents the dream catchers. For those who want something totally unique and different, we can also make a special LED fairy lights dream catcher for your event. These come with white, warm or multi-colored LED lights, and you can see a sample in our shop. At our retail shop, we offer dream catchers in many shapes and sizes, starting from as small as earrings, all the way to as large as 100 cm in diameter. The total length of the dream catcher can also reach to about 180 cm or 6 feet. We offer custom made dream catcher and ready made dream catchers for hanging in cars, bedrooms, living rooms, cafes & restaurants, office spaces and just about anywhere you like to decorate them. Apart from having the above, we also sell the materials to make dream catchers. Meaning we provide the rings, feathers, beads and web string. This is for those who make dream catchers as a business or hobby. With today’s lifestyle trends, many love the Bohemian or Coachella themes, and dream catchers contribute largely to part of these themes. In Malaysia, the Bohemian wedding theme is highly popular, and having large dream catchers will beautifully compliment your wedding theme decorations. Instead of buying the large dream catchers, which can cost quite a lot of money, you now have the option to rent dream catchers for your wedding or event from Green Daun. How to Rent a Dream Catcher in Malaysia? First, you need to visit our retail shop to see the available dream catcher designs for rent. If there is nothing that suites your event, wedding, birthday or party theme, we may be able to do a special customized order just for you. Usually, many people plan things on the eleventh hour or last minute, and when you are in that situation, you most probably have to rent what is available in our shop. The best option is to plan well ahead, and talk to us about your dream catcher design and color. We can then customize the dream catcher which takes about a couple of weeks, depending on the size and design. For those who plan to make their own, we also sell dream catcher materials in our shop. This means you can just walk in and buy what you need to make your own dream catcher. Please note that we do not simply create dream catchers for the sake of doing it. We take passion and pride in our creations. Generally, it takes about a week to ten days to do a large sized dream catcher, and up to a couple of weeks for a giant dream catcher. To find out more, contact us or visit our shop and we will gladly assist you in what ever questions you may have. We are not party or event planners, but we are dream catcher creators, makers and designers. 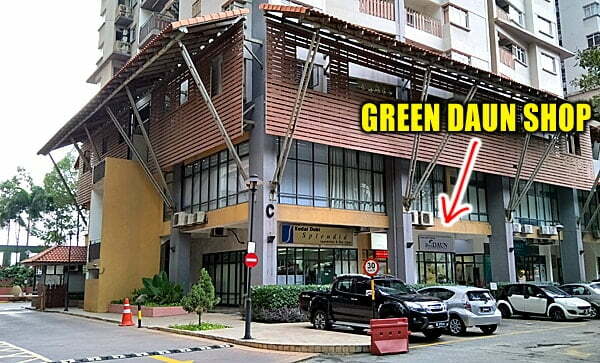 Green Daun is located at the ground floor of Block C at the Perdana Exclusive Condominium in Damansara Perdana, Petaling Jaya. We are about five minutes drive from IKEA PJ, IPC Shopping Mall and The Curve Shopping Mall. Use Waze to find us or here are driving directions to Green Daun. Our business hour are 11.00 am to 8.00 pm from Tuesday till Friday, 11.00 am to 6.00 pm on Sat & Sun. We are closed every Monday. Our terms of payment is cash or direct bank in as we do not accept credit or debit cards. If you have a friend or an event that requires some beautiful dream catchers as decoration, you now know where you can get them. Green Daun provides dream catcher rental in Malaysia for anyone who requires them. Contact us for more information. Hello Esther, thank you for the comment and yes I do. It is best for you to communicate with me via email here – thegreendaun at gmail dot com. I have also contacted you via email. Look forward to your email and have a great day there.